The village of Honningstad's annual tribute to Gothnir, the dragon in Fangcrag Keep, was intercepted by an exceptionally depraved band of giants. If the dragon awakes and finds his tribute not delivered he will surely descend upon the village. But if the adventurers head to the keep to slay or barter with the dragon, the giants' captives will surely suffer a terrible end. The choices are hard, and there is little time solve both dilemmas. Plan well brave adventurers, for the lives of many rest in your capable hands. A Pathfinder Roleplaying Game adventure for four 7th-level PCs by Carl Bussler. NOTE: Also included with the PDF of the adventure are JPG maps scaled for use with various virtual tabletop programs. Kobayashi Maru for the PCs? This pdf is 40 pages long, 1 page front cover, 1 page editorial, 1 page ToC/SRD, 1 page back cover, leaving 36 pages of content, so let's check this out! This being an adventure-review, the following text contains SPOILERS. Potential players may wish to ump to the conclusion. Still here? All right! The village of Honningstad is known for their stellar ale and ever since a local brotherhood of monks devoted to oaths has struck a deal with a dragon, an annual tribute of brew has kept the village from harm. Unfortunately for the village, this year is different - the tribute was highjacked by a group of particularly nasty ogres and a hill giant and never reached the dragon. Thus, the brokered oath is broken and the dragon prepares to lay waste to the town- Worse, the benign order of monks actually adhere to a heresy of the belief in the god of oaths and are as evil as it gets, helping the dragon to wreck vengeance. The PCs have a tough choice to make from the start - either try to track down the giant and rescue the people who wanted to deliver the original tribute or venture to the monastery and broker a new deal with the monks and the dragon - in any case, people will die. This Kobayashi Maru-scenario is the basis for this adventure and it uses a clever tool to drive home the importance of time - the scroll of omens. Almost every action of the PCs that takes up time has a consequence, with a token being moved along the scroll and prophecies/updates of what is happening being relayed to the PCs. This idea is GOLD and the verses are awesome. Depending on the road they take and choice they make, the PCs will have to brave the abandoned elven tree outpost Althair Tulanir (4 levels) and defeat the half-fiendish hill giant Rhott and save the captives . If they instead venture to the monastery (2 larger levels), they will have to defeat the oathbreakers, their bound ghosts and broker a new peace/kill the Fjord Dragon and potentially save Honningstad from devastation. The pdf also includes an appendix, which details the village of Honningstad and its inhabitants. Editing and formatting are ok, though not stellar - I noticed quite a bunch of editing glitches that could have been prevented, even though none particularly detract from the overall appeal. Layout adheres to a full-color, two column standard with a rune-covered top and bottom. The pdf is rather printer-friendly. The pdf also comes with bookmarks and a map-pack that features high-res jpegs for the maps of the dungeons sans keys, numbers etc. Commendable and cool! However, why no key-less version of the Honningstad-map was provided, I don't know. The full color maps are neat, btw.! The adventure oozes a somewhat northern flair, which would make it easily insertable into any campaign, but particularly so into any that feature somewhat Germanic/Scandinavian areas. Nomenclature is mostly coherent, though some of the names fall through the roster. Generally, though, the scenario feels organic and well-written. This is essentially Kobayashi Maru for PCs - they can't win and each choice they make has consequences. Being a huge fan of the "Witcher"-novels and games, I can get behind that - only that I know that my players WILL split the party and might, with the right strategy and luck perhaps even prevail in succeeding at both tasks. While this would be exceedingly tough, almost impossible in fact, it makes for a nice additional possibility... and something a GM has to keep in mind. If your players don't like no-win scenarios, this one has to be done with utmost care, but if done correctly, may provide for some memorable sessions. All in all, I enjoyed the module and if you think your players can deal with it, this is a good 4 star-module. Has anyone bought this? Is it worth the asking price? Any free previews we could check out? Looks like a cool blurb. I love the moral quandary it throws up - that's the kind of thing that generates great roleplaying between PCs. 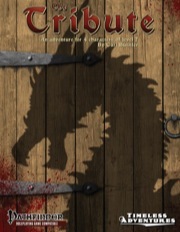 Reviewed here, on DTRPG and sent to GMS magazine. Cheers!